Save emails from Outlook.com as HTML! 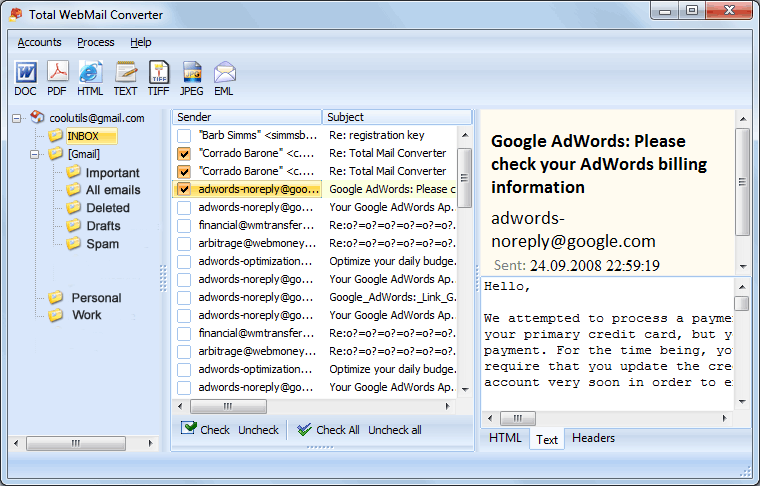 You are here: CoolUtils > Total WebMail Converter > Save emails from Outlook.com as HTML! 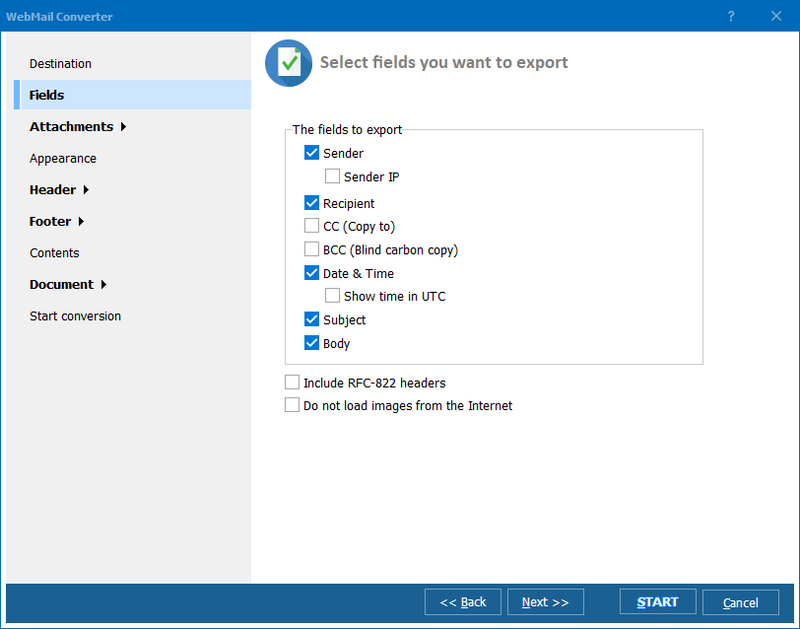 If you are still wondering where to find an appropriate program that exports emails from www.Outlook.com to HTML, you can stop wondering and try Total Webmail Converter. This is a unique email conversion utility, which synchronizes with your email account and converts any amount of messages to HTML and many other popular formats. Thanks to the user-friendly interface and extensive functionality, both savvies and beginners enjoy using this email converter. If you have acquired this utility, you can handle your emails in different ways. 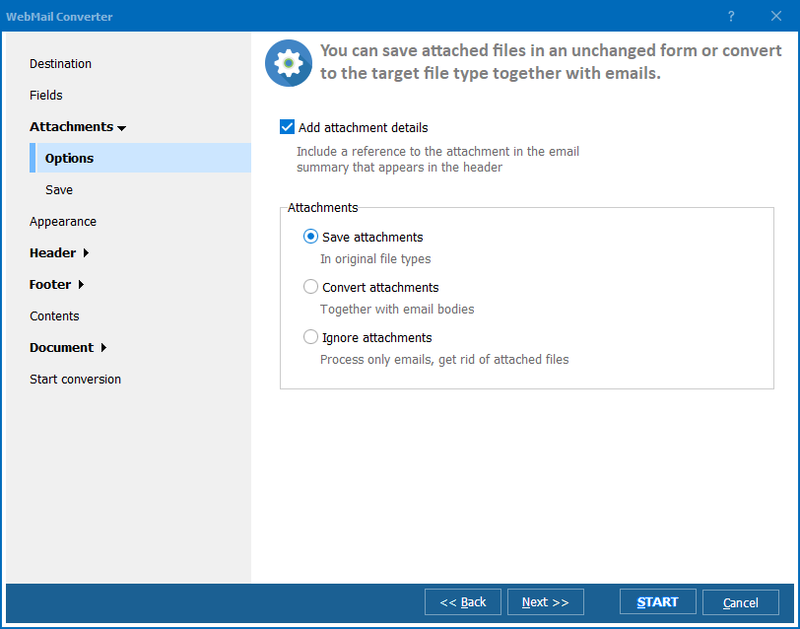 For example, you can combine several emails into a single file, set appropriate file name templates, process attachments in your preferred ways, etc. 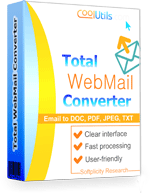 With Total Webmail Converter at hand, you can dub your entire correspondence and keep safely it on your hard drive or any removable disk. This can be very helpful if your correspondence contains important or confidential information. Last, but not least, comes the price, which is quite low for what this program can do! If you have used at least one of our converters, using this one will not pose any difficulties for you. Download the converter, double-click on the icon and enter your email address and email password. This is done to sync the converter with your email account. Run Total Webmail Converter and click on the needed folder on the left, for instance - Inbox. Check the messages, which you want to save as HTML files. You can press Check all thus set the converter to process all the messages. Select HTML in the toolbar. Specify destination for your target HTML files. Select a file name template. Make sure the program is set to export fields that you need to export. Check options, which you wish to apply to files attached to you emails and tune the output document appearance. If you are not experienced enough, you can choose not to modify these settings and use default parameters. Review your settings via the Start Conversion tab and press Start to convert Outlook.com emails. You can test this converter for free using the trial version and make your own opinion about it rather than relying on descriptions.